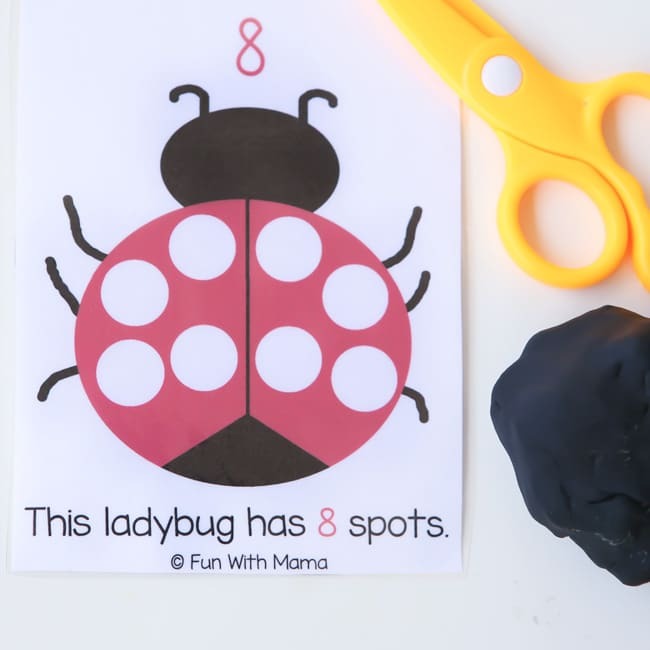 This toddler and preschool Ladybug Insect Playdoh Math Counting Mats are perfect to work on a child’s early preschool math skills, one on one correspondence, fine motor skills and visual perception. 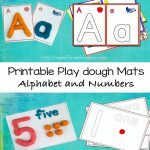 This educational activity is great for toddlers and preschoolers who love playing with playdoh and can be used to fingerpaint too. You could also use other paint materials like do a dot markers. 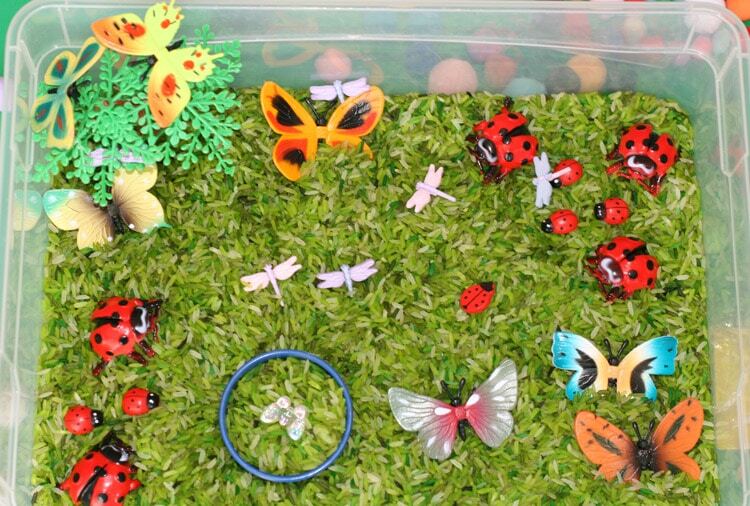 Our current theme for the month is Spring and Bugs. 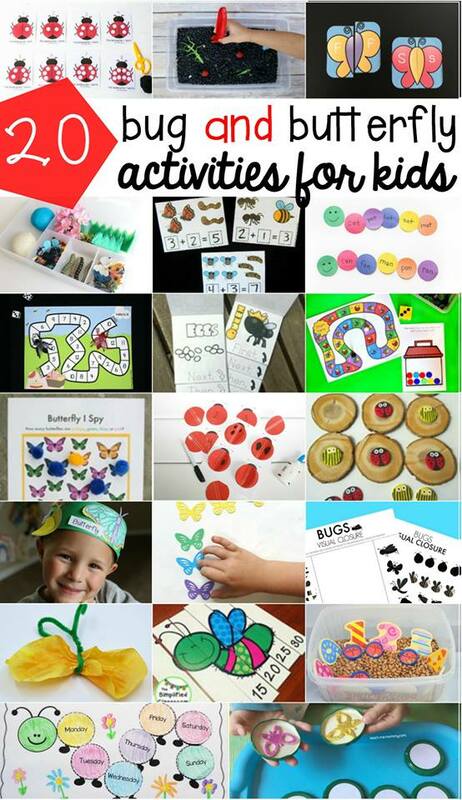 Grab your copy below and then scroll down for even more awesome bug themed activities! 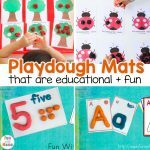 My play dough mats are popular here on the blog because kids love any reason to play with playdoh. Sometimes they may get bored of having no direction so it’s always a good idea to change it up. 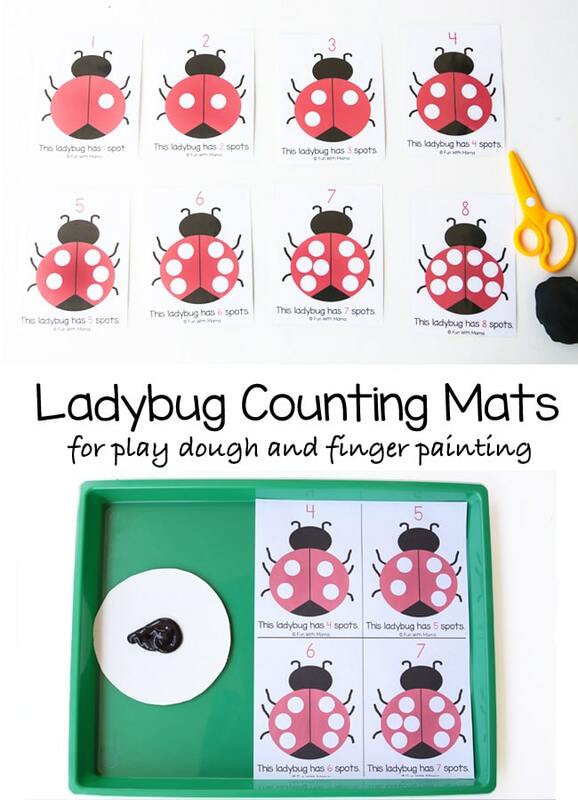 My daughter loved our Apple Tree Counting Play dough Mats and my Ladybug Visual Perception Cut and Paste Activity has always been a very popular activity on my blog so I set out to create something very similar for our current theme of Bugs. 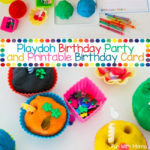 Teach your child how to roll little balls of playdoh. For a younger child you might need to precut the right size of circles. 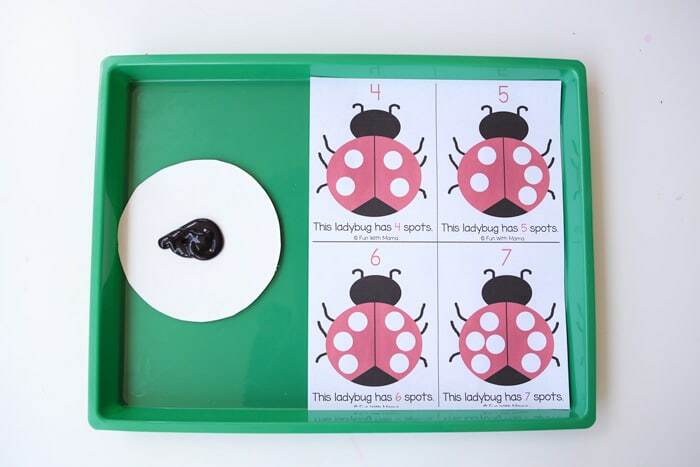 Show them how you roll the ball in the palm of your hands and then place the play dough ball onto the white part of the ladybug. My daughter loved counting all the balls (“dots”) of play dough. This is wonderful for reinforcing one on one correspondence. 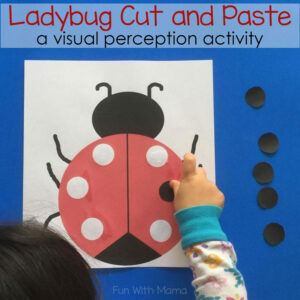 My 6 year old daughter often loves helping my 2 year old daughter do her preschool activities. She is such a sweet and involved sister. See how she helps her roll the balls and has her little sister place them in the correct spot. I always like to incorporate my 6 year old into our activities too. 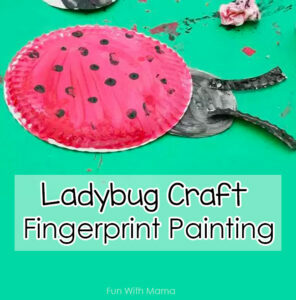 Here I placed some black paint onto a tray and my six year old needed to use her fingers to paint onto the ladybugs. Kids and painting is always a sure hit! 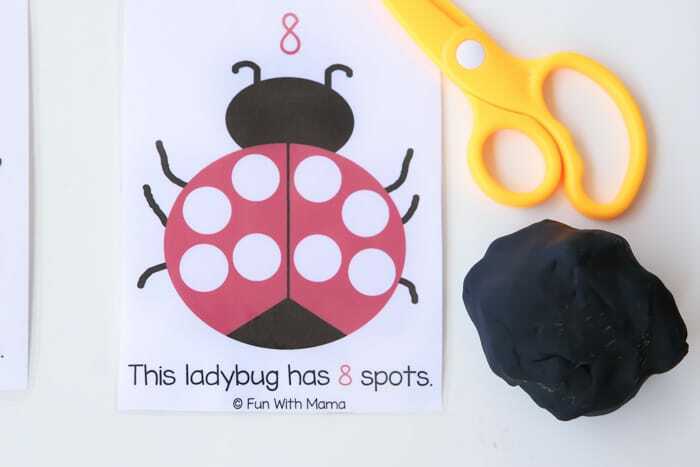 My 2 year old had a go with this too and loved dotting the black paint on to the ladybugs. When done we left it to dry then cut it out so we could go over it later in the week. 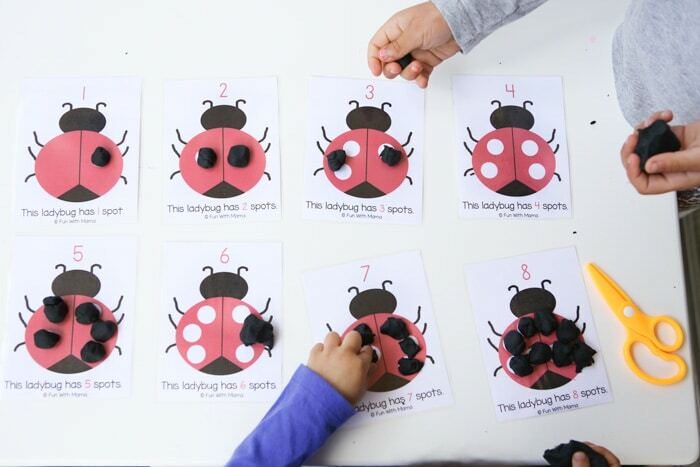 We would then count how many spots each of our ladybugs have. I was very surprised that at 2 years old she could count the dots in order and knew exactly what I was talking about. I think all the toddler activities that we are doing seems to be really teaching her numbers and counting. 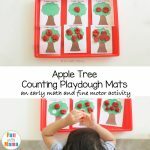 We love using play dough mats because sometime’s kids like doing activities with some direction. This gives them an inner feeling of accomplishment. Little do they know that they are working on preschool fine motor skills. We added this activity to our fun Bug Themed Sensory Bin for even more hands on fun! 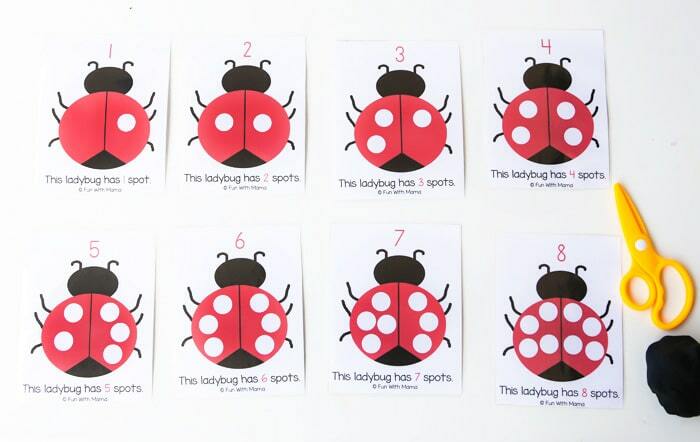 I have included two versions of these counting mats. One set includes the dots you see below. The other set has no dots. You can choose which one you and your child like better and go with those.